So I got a surprise today when I bought an item from the Millionaire Center, I've spent 1 billion (gulp) sp in there and got the achievement. The prize is a Blackmoons War Plate which is kinda cool. Problem is I have no idea what it is worth and there's only three on the Trading Post with no prices. I have a few other weapons I switch in sometimes including a Cork Tipped Cutlass, Malerias Short Sword, Prodigy Staff, and Truth Serum. Would the Blackmoons War Plate be worth using in my set or should I try selling it? Can I put my minor battle achievements in this thread as well? 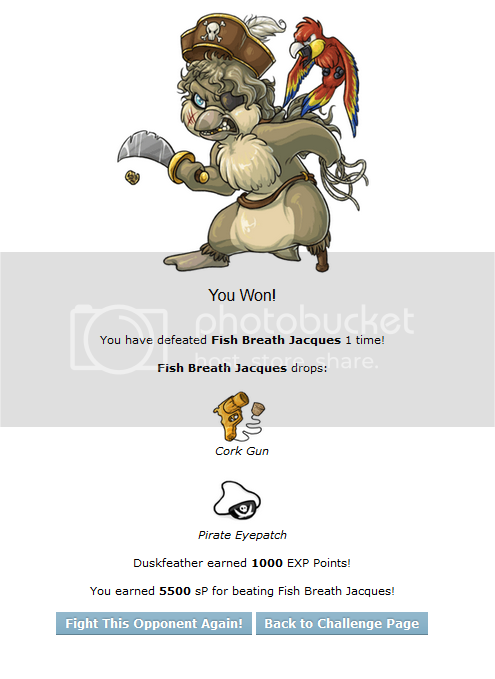 You have defeated Fish Breath Jacques 1 time! You won a(n) Very Hard token to use in the battle shop! First very hard battle opponent beaten. Now I need to figure out how to deal with that stupid cat. That's an awesome achievement Marah! I was so stoked when Ishka was able to beat him for the first time. I had the hardest time getting that penguin down to 0hp, we tied a lot. I think it's a more-than-minor achievement, too! I've gotten close but still haven't managed it yet. Apparently the Crystal Shop is going to be emptied and restocked next week. 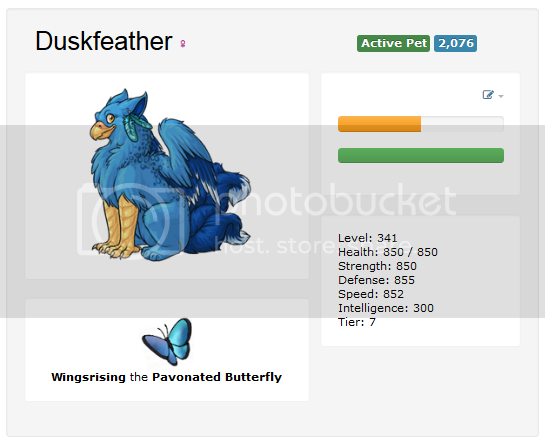 My battle pet is almost tier 5, and his current set carries two bombs. I've got about 800 crystals from fragging BQ junk. Do I buy a BunBon (333 crystals) to replace my Mystical Star Shuriken? Do I buy two, make a BunBonny out of one, and replace both the Shuriken and my Bottled Tornado? Or do I save my crystals, bank on the Crystal Shop getting some better stock, and either buy bombs with sP or start carrying extra healers instead? Still haven't been able to manage to get a 5th win on Felibot, though. Soothing Current Scroll, Cobalt Eternal Scroll. Any thoughts on the best way to goose my set for Tier 7? I already switched the bomb out, of course. Can you have more than one of the same scroll? Is so, would it be worth adding a second Cobalt Eternal Scroll while it's still in the Millionaire Center? Or some other better, reasonably-priced scroll? 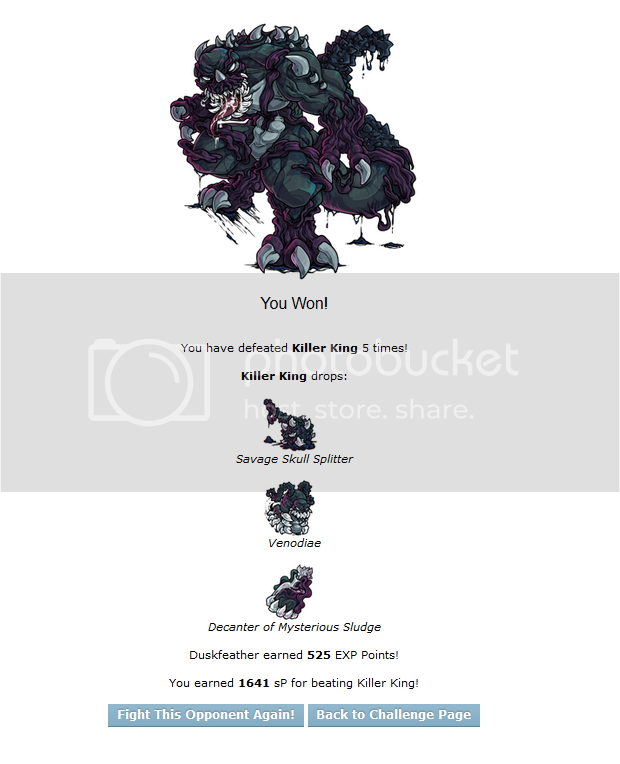 Awesome achievements Wingsrising I love the drops you get from Killer King. You can never really have too many Cobalt Eternal scrolls in my opinion. I have four of them currently attached to Ishka, though I did have five. Swapped one out recently for a Shriek of Despair I didn't realize was hiding out in my gallery. Cobalt scrolls are great for when you need a round or two to heal up or just turtle out the last few rounds when you are getting close to winning and out of other healing options. I love mine. I posted in the Achivements thread that I had bought a Manifesting Weapon, but I also just recently purchased another nice and expensive one as well, the Possessed Bow. With the site being glitchy and me being preoccupied with other things I haven't used the Bow to much but it's nice to have other weapons to mess around with and it did let me get another win on Maleria's Familiar bringing that up to a grand total of two wins. Still can't use my Manifesting Weapon though but Ishka is inching ever so slowly closer to Tier 12 so hopefully sometime soon. I managed to score my 5th win against Felibot, some wins against Slavam, and 5 wins against Uilliff (I was confused about Uilliff at first, I'd forgotten about buying the appropriate Research Notes in December). Still can't rack up 5 wins against Jacques. His critical hits are just wiping me out. Congrats on T7, Wingsrising (and your cool wins, too)! I just left T7 a week or so ago, so I thought I'd add my two cents. I personally really like having a combo of Terra Focujin, Singed Stuffing and Cobalt scrolls. Terra Focujin is expensive, though, and I think that for the time being Soothing Current would probably serve you well if you have the AP. I know nothing about bomb scrolls, so I can't help you there. I'd probably stick to the lower AP defense/healing scrolls for now. For your actual battle set, maybe sub out the Azazoth Curled Bow for a Twisted Rift Blade? I used Reborn Icewand of Doom and that for my main attackers for T7 since they both offer a heal every round. The Forj Machete does a bit more damage though, so you'd have to play with both to see which you like better against different opponents. So jealous of your Possessed Bow, Seerow! I've been keeping my eyes open for one recently even though I'm nowhere near T10 yet, but they're so expensive. Someday. Yeah, Cobalts are definitely great. I recently got a third which I should be able to equip soon-ish, I need to spend about ~17.5mil to get Algebra enough intel for another. My current setup is Holy Deluge (obligatory mutliheal), 2 Shrieks of Despair, a Psycho Smasher and 2 Cobalts. The Cobalts are great for Prodigy; I lead with Manifesting Weapon and Soma Tablets in hopes of blasting something like a H20 Synergy or Molecular Storm, so the Cobalt (hopefully!) protects me from any large dark or fire he deals. If Soma don't freeze, I use my second with my Manifesting Weapon and Recycle Blaster. If it does I save it until much later in the battle, if I need to drop Possessed Bow (usually when I need to use my Rapier of Error to curse him) it gives me a cushion, and also potentially helps block any dark from the quarks he's generated by then. And they're also great for Maleria's Familar. Dark and earth block can really help when you're in a squeeze (coupled with wind block from a trident). Anyway! Definitely look at upgrading your healer. It's something you will have to do one day if you want to get further, it's a matter of how long you're going to put it off I guess! I upgraded my Soothing Current at a similar position you're in atm, Wings, and have never looked back! It was probably cheaper to make a Holy Deluge back then, but I used the Tome I won from Jacques so it was a bit cheaper. Terra Focujin is great if you can afford it, and if I wasn't looking ahead to a god scroll, I'd definitely consider 'upgrading' my Holy Deluge. Because saving 12AP is equivalent to almost 100 mil in int boosters, heh. And I think the Twisted Rift Blade is a great endorsement, from what I've seen of it.